Standard - £56.99 Only 3 left! Let’s get one thing straight, shall we? There is an enormous difference between being the life of the party and being the life of THE party. You dig? We of course mean Mardi Gras, the festivities that bring about some of the biggest, baddest, boldest partying of the year. To be king here is to be ruler of all revelers; period. 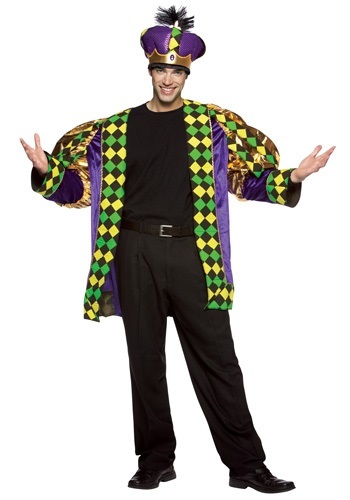 But before you descend on the French Quarter, you need to make sure sure you’re all set to look like Mardi Gras royalty. Picture this if you will: you, dressed in this Adult Mardi Gras King Costume, atop of a fantastic float and draped in thousands of beads? Sounds like the good life, eh? Well, we can't promise you a ticket to N’awlins, nor do we know exactly how the Mardi Gras-ians decide who is and who is not float-worthy , but we can guarantee that you will look the part of king of the Mardi party in this ensemble. And that is the first step. Festooned in the signature Mardi Gras hues of this jacket, you’ll fit right in with the other revelers as you parade through the the Carnival of Bourbon Street. This costume comes topped with a foam purple hat that looks will make you look like a cross between a sultan and a king...cool! The best part of this outfit is that you get two wears out of it: once in October for Halloween and again when Fat Tuesday roles around. Just don’t tell anyone you’re the “king” of Mardi Gras, lest they mistake you for a baby they may find in a cake!